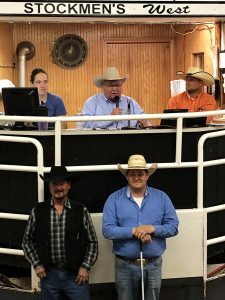 Location: Mitchell Livestock Auction, Mitchell, S.D. 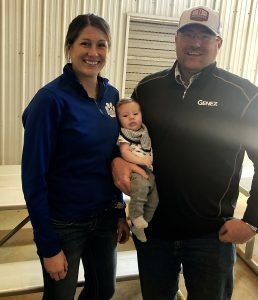 Kevin and Helen Geppert brought to town a uniform set of bulls. 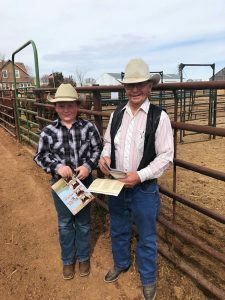 These high quality boys came off the cow with impressive yearling weights – averaging 800 pounds – and on sale day their mild dispositions were noticed by the crowd. Twenty two of these guys scanned ribeyes over 15 inches. This great family operation works together to bring the very best town and the buyers were clearly impressed. After a delicious roast beef dinner before the sale, Helen set out some impressive munchies after the sale that included locally-made cheese, along with crackers and meat. What a treat. 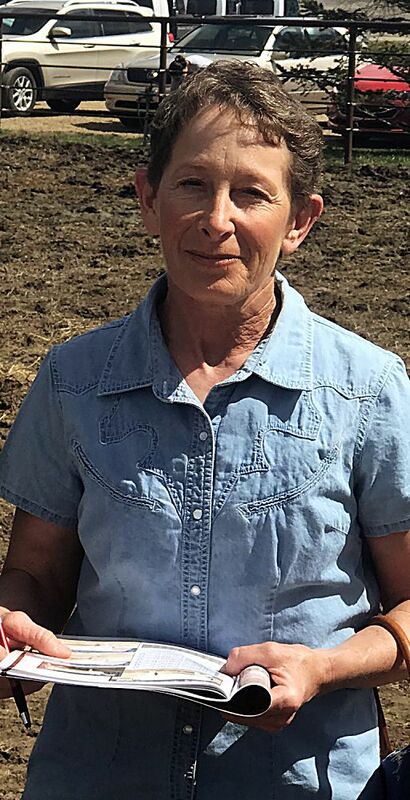 Lot 6 – $19,500 to Mike and Jodie Lehrkamp, Caputa, South Dakota. He was an Active Duty son out of a Connealy Impression daughter. EPDs – BW 1.1, WW 73, YW 135, Milk 31; Actuals – 62 pound birth, 882 pound weaning weight, with a weaning weight ratio of 112. This guy ranked in the top one percent of the breed for YW and WW EPDs. Lot 28 – $15,500 to John Goeken, Utica, South Dakota. He is a Brilliant son out of a Bando 1961 daughter. EPDs BW .5, WW 62, YW 100, Milk 31; Actuals – BW 72 pounds, weaning weight 957 pounds. This heavy muscled bull also scanned an 18.7 inch ribeye. 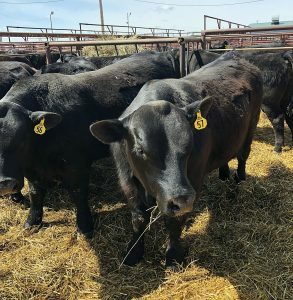 Lot 17 – $15,000 to Nelson Angus Ranch, Carpenter, South Dakota. He is a Barstow Cash son out of a Connealy Thunder cow. This bull had these EPDs: CED +11, BW .5, WW 60 YW 112, Milk 26. He started life with a 75 pound birthweight with and left the cow with a 953 pound weaning weight, scanned a 17.7 ribeye, and figured up a 120 $B. Lot 9 – $12,000 to Dave Nichols, Chambers, Nebraska. Sired by Active Duty, out of a Bando 1961 cow. EPDs – BW 3.5, WW 65, YW 122, Milk 31. His actual numbers came out this way: BW 78 pounds, WW 853 pounds.